What are pharmacy label sheets? 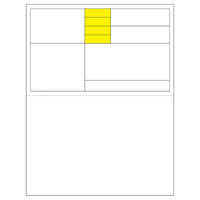 Pharmacy label sheets are sheets of paper (usually 8.5x11") that have multiple peel out labels built into them. They are used by pharmacies to label pill bottles, patient records, create an invoice or receipt for the patient and/or insurance company, or anything else the pharmacy needs on a label or on record. Since each pharmacy operates differently, these pharmacy label sheets are typically custom designed for each pharmacy. These custom peel out label sheets can be in any layout, any size (any number of different sizes), with the pharmacy's logos and text pre-printed on them. The label sheets can be used with either inkjet or laser printers (no specific thermal label printer to purchase). The only thing you'll need to worry about as far as which type of printer to use is whether or not the label has a chance of getting wet; inkjet ink won't hold up well against water, but laser toner should be fine. How do I order custom pharmacy label sheets? Contact us to order your custom pharmacy label sheets. Let us know how many labels per sheet you need, what the layout is, any perforations you’ll need, any colors and/or text you’ll want preprinted on the sheet, and any other specification you’ll need for your custom pharmacy label sheets.